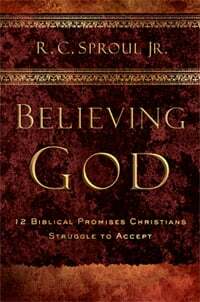 In his latest book, Believing God: 12 Biblical Promises Christians Struggle to Accept, Dr. R.C. Sproul Jr. challenges Christians to take a second glance at the promises of God in the Bible in order to see anew the grandeur of what God has committed Himself to do for His people. Sproul explores twelve of the most significant promises in Scripture, methodically unpacking each divine pledge. He shows that while Christians may express trust in God’s words, they refuse, in numerous ways, to stake their lives on what He says. In this interview, Sproul tells us about the background to this book, its importance in his own life, and his hope that the book will help Christians live lives marked by unshakable faith in the promises of God. You have said you were inspired to write this book out of a passion to see Christians take God at His word. Where did that passion come from? I wrote the book to help my own unbelief. I was and am persuaded that Christians struggle to take God at His word precisely because I struggle to take God at His word. Of course, all our troubles began with such a failure. Adam and Eve failed to believe God, and they not only suffered for it but brought judgment on all who would follow after them. Jesus, on the other hand, believed God, and through Him we are blessed. How did you decide which of the many biblical promises to feature in this book? I wanted to cover a broad spectrum of promises, some dealing with very practical matters, such as tithing, wisdom, and children; others dealing with future promises; and still others dealing with the gospel itself. It was not an easy chore to whittle the list down, but I am hopeful that as people come to believe the twelve promises covered in the book, they will learn to trust the promises that fill the entirety of the Bible. The subtitle to this book is Twelve Biblical Promises Christians Struggle to Accept. Since we know in our heads that God is trustworthy, why do we struggle to accept some of His promises? We don’t understand grace. Though we often seek to suppress the truth of our sin, we know, at bottom, that we are unworthy. The Devil, the accuser, uses this reality to discourage us, reminding us that we are not worthy so as to hide from us the glory of God’s promises. Of course we’re not worthy. God gives His promises not because we are owed these things, but because He loves us as His children. As both a sinful son and as the father of seven sinful children, I find great comfort in that fatherly love, and it ought to be a comfort for all of us. Do you think it is possible that we take the promises of God for granted? In an ironic way, our failure to believe God’s promises and the foolishness of taking those promises for granted are one and the same. When we are not amazed by His grace, we are of necessity not seeing it in all its astonishing glory. We ought to wake every morning stunned that we are still here; awe-struck that while we were yet sinners, Christ died for us; agape that we will be with Him for eternity and that we will be like Him because we will see Him as He is. That we could yawn at God’s gospel promises, just taking in the breadth of the promises even before we consider the cost, is a sure sign that we are sinners to the core. If, on the other hand, we enter more fully into the promises of God, we will live lives of perpetual gratitude and joy. We have been given everything in Christ Jesus, and fools that we are, we spend our time grumbling about this economic hardship or that spiritual challenge. In what ways are our lives altered when we believe God the way you describe? First, we enter into the abundant life Jesus came to secure for us. We who are Reformed not only see holiness as more important than happiness, but tend to see them as opposite ends of the spectrum. The truth is, they are one and the same. If God has showered us with His love, and He has, then the more we heed Him, the more we submit to Him, the more we actually receive and rejoice in that love. This is how, even as we pick up our cross daily, we are able to count it all joy, as James calls us to do; this is how we can rejoice, and again rejoice, as Paul commands. Second, we become more grounded. As we believe the promises of God, we are less likely to fall for the temptations of the Devil. If I know God loves me now as He loves His own Son, why should I clamor for the approval of the world? If I know that I will inherit the earth, why should I fret if my 401(k) loses value? Third, we please our Father in heaven. If you were pouring out grace and love on those under your care, wouldn’t you like them to receive and rejoice in those gifts? Believing and obedience are one and the same. Psalm 37:4 promises that God will give us the desires of our hearts if we delight in Him. You address this in chapter 6 by saying, “We believe, I believe, that we cannot meet this qualifier because we can’t begin to understand it.” What does it mean to delight in the Lord? To delight in the Lord is nothing other than beholding His glory. When we are blessed to see Him, even as through a glass darkly, there are no other steps we need take to delight in Him. In my book Almighty Over All, I devote a chapter to the simplicity of God, the idea that He is not a string of attributes, but is, as we read in Deuteronomy 6:4, one. His beauty, His glory, His holiness—these are all one thing. As we learn to see Him in His Word, in His creation, and in and through His Son, our rejoicing ceases to be tied to our circumstances and is instead grounded in His being. Remember that David knew he would not want long before he had green pastures and still waters. It was enough that God was His Shepherd. Sadly, in our day, God is marketed through a series of bullet-point promises: Come to Jesus and your family life will be better, your finances will be more ordered, your breath will be more fresh. These promises may or may not be true, but this we know—if we come to Christ, repenting of our sins and trusting in His finished work, then God Himself is our exceedingly great reward. That’s not just enough, but too much. How would you encourage parents to model belief in God for their children? Modeling belief in God isn’t a child-rearing practice you can take up for the good of your children. It is, instead, the very calling of our lives. That said, when our children witness us rejoicing in all things, as they live in a home grounded and stable because of the unshakable promises, they will grow up in a culture of faith. On the other hand, we should remember the admonition of Christ, that of such is the kingdom of God. We ought to be looking to our children to learn how to believe God. As my wife and I in quick succession each went through cancer, the peace and calm of our children was shocking and inspiring. I pray regularly that God would give me faith as He has given faith to my children. Albeit imperfectly, which Christians from history or ones you’ve known model the type of faith you describe? How has the process of writing about this topic helped you in your own walk to believe God? Exactly as it was designed to. In the preface, I noted that even as my father has devoted so much time and effort to helping people understand the holiness of God in all its fullness, not because he has mastered holiness but because he knows that he needs to, so writing this book on believing God has been a potent spiritual exercise for me, not because I have mastered believing God but because I know I need to. I have not come out on the other side of the writing process having mastered this calling. Instead, I have come out strengthened in my conviction that this is what I need to learn. I am grateful that, by His grace, I see more than I did before of the glory and the fullness of His promises. But I delight to remember that I will have all eternity to grasp more and more the scope of His glory and the depth of His love. Who do you hope picks up this book and reads it, and what do you want their takeaways to be? I hope, of course, that every Christian will pick up this book. Still more, how wonderful it would be if even unbelievers would pick it up and grasp a bigger picture of the fullness of the gospel. My heartfelt prayer is that those who read this book will move through their days with greater joy, and greater faith, that they will walk through the hardships of this world with an unshakable confidence in the unfailing love of the God of heaven and earth. I want them to take away a greater capacity to hear the Word for what it is, the very voice of God our Father.